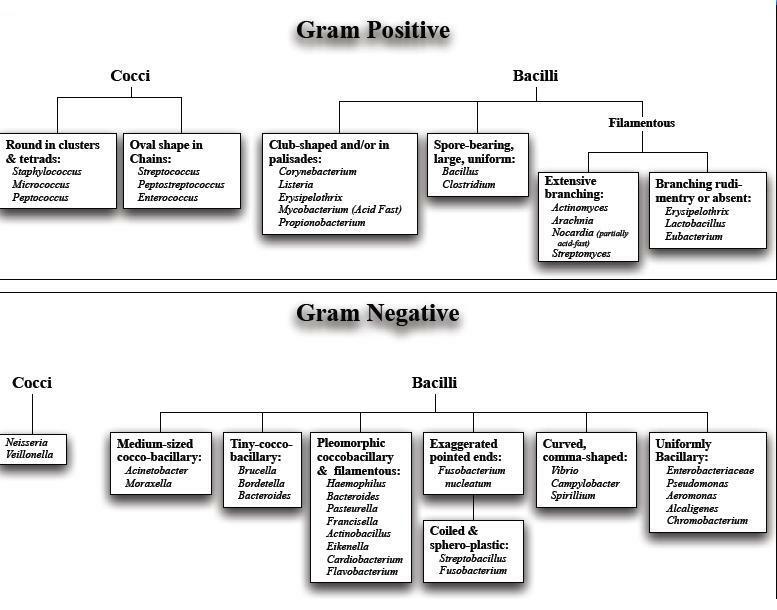 The different types of bacteria can be classified on basis of the different types of responses to gram stain.The following chart represents a classification based on Bergery’s Manual of Determinative Bacteriology. BUT WHY DOES GRAM STAIN COLOR DIFFERENTLY ? In order to understand the action of the gram stain in differentiating the bacterium, we need to have a look at the cell wall composition of the bacteria .In them, the cell wall has a little difference . In gram negative bacteria, the cell wall is much thinner with low peptidoglycan concentration but high lipid content. Hence the crystal violet gets decolorized when washed due to restraining activity of the mesh like peptidoglycan in gram positive cells. Thus another stain (counter stain ) becomes very important . Well it is easy to use the different stains like H&E , Nile blue sulphate, or Neutral red or Leishman to stain different cells and observe them. But does it apply the same for bacteria? l forgot to mention that bacteria are the largest numbers of life forms on this planet, existing form within your intestine to the deep underwater vents of hot gases under the ocean or the Tundra! It is also interesting to note that all bacteria can be basically divided into two groups on basis of their staining properties by a stain called Gram stain, discovered by Hans Christian Gram in 1882–1884. Bacteria can be categorized into two types-Gram positive and Gram negative. The section is flooded with Crystal violet or the Primary stain, as it colorizes all types of cells . Crystal violet is washed off after 1 minute with distilled water. The section is flooded Grams iodine solution , which is called a mordant or a helper. Iodine is washed off after approximately a minute. The slide is washed with 95% alcohol or alcohol -acetone solution to remove excess purple from some bacteria, it is decolorization agent. The slide must be kept at an angle and alcohol has to be poured till there is no purple tint. Slide is washed immediately with tap water. Slide is counter stained with safranin for 1 min. It is washed with distilled water, air dried and mounted for observation. In addition to the light microscope, the electron microscopes have opened a great pasture for the biologists as well as other fields who need to work on the minutest details like the aircraft structure that should not have a microscopic scratch or the structural consolidation of an alloy so as to say. In case of electron microscopes, the basic pattern of operation is same, there are the power source, lenses, objectives, specimens but the components differ. Like in an EM, the power source are beam of electrons produced from a tungsten filament at very high temperatures that are guided by electromagnets in the body of the microscope to be incident on the specially prepared specimen. The specimen is coated with heavy metals like osmium or old so that the electrons are reflected off the surface to form secondary electrons. The secondary electrons are captured and processed to form an image on a fluorescent screen as a negative which is converted by a software into a positive image. This is the Scannimg Electron Microscopy. IN case of transmission Electron MIcroscopy, the specimen sections by making hard resin blocks and then subjected to the electron beam. Some of the eletrons are deflected from the surface while others pass through and eventually an image of the interior of the cell is produced.. 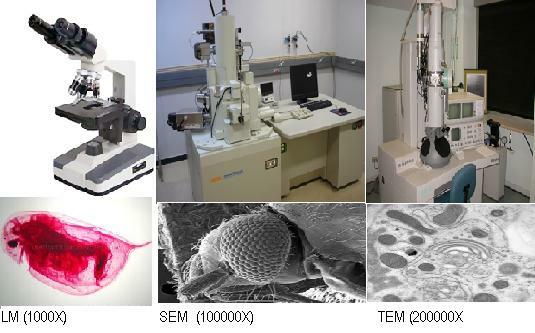 Stereo Microscope, Comparison Microscope, Confocal Microscope, USB Microscope<span MICroscope, Dark Fields MIcroscope, Scanning Tunnelling MIcroscope, Pterographic Microscope, Polarizing microscope, Epifluorescence microscope, Confocal microscope etc. Limit of resolution of a microscope refers to its ability as to how much it can clearly distinguish between two closely placed points <span and how close they are. . Here , there is an inverse relationship between the limit of resolution and what is actually resolved since the resolution increases as the distance decreases. In order to change it into a direct correlation, the increase of the limit of resolution is used. Limit of resolution = (0.61 x λ) / N A ( Numerical aperture), resolution = NA / (0.61 x λ).The Scanning Electron MIcroscope has a resolving power of (30 -100) Angstrom while that of TEM it is ( 3-10) Angstrom .The limit of Resolution in a light microscope is about 300 times less than SEM. The use of microscopes help us to get magnified images, but how does it do that ? Actually f you remember , the microscope has 2 lenses, the objective lens and the optical lens. Boh these lenses act together to create a virtual image of the object , that is much larger than the original one. A look at the ray diagram will hell you clear the idea.